①I was surprised at(by) her performance.／surprised to see her performance. ②We are always surprised at(by) his words. ③They were surprised at(by) the news.／to hear the news. 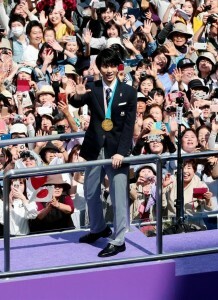 A: I went to Sendai to see the Triumphal-parade of Hanyu Yuz uru. B: Oh, that Gold-medalist!? How was it? A: I was surprised at the audience’s good manners. B: Oh, I’m not so surprised. That’s Japan!